QUAKETIPS: Double feature Part I: If you install a closet organizer system, don’t skimp on that last screw. How many of you have closets that look like this (Figure A)? These are closet organizing systems, a big business, with companies like California Closets and the Container Store (Elfa brand) making it possible for a small space to accommodate lots of shoes, slacks, shoes, sweaters, shoes, suits, shoes, and if you are like some people I know, shoes. You install these yourself, or the company will come out and install them for you, and they can make a huge difference. 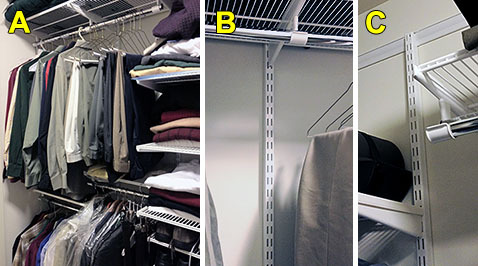 They work by installing shelves and clothes-hanging rods that are all cantilevered from vertical rails on your wall (Figure B), which themselves are hanging from a horizontal strip of metal fastened to the wall at the top (Figure C). I installed one of these Elfa systems in our closet a couple of years ago. It’s pretty impressive, and can hold a couple of hundred pounds in the configuration that I used. The amazing thing about this popular system is that it is only attached at the top to that thin horizontal strip of metal that is fastened to the wall by one small bolt every 16 inches (wall stud spacing). The rails have hooks at the top with which you literally hang them from a groove in the strip (Figure D). That means that the rails and everything else attached to them can swing out as a single unit from the wall attached only at the top--but they don’t, I’ve been told, because all that weight is pulling the rails down against the wall and it’s remarkably stable. The heavier the junk is that you put on the shelves, the more it presses against the wall, and those handful of bolts at the top are sufficient to keep the whole thing in place. In fact, if wall studs are not handy in the right positions, you can even go right into the dry wall with the appropriate anchors because (they say) there will never be a force outward, just downward. They do sell little fasteners that you hook onto the bottom of the rails and screw into the wall just to ensure that the rails don’t swing out if you have pull-out drawers in your system (Figure E). That’s supposedly the only time you’d need such things. Well, what’s missing from this picture? The San Andreas and Hayward faults, of course, or your favorite other local earthquake source. I would never DREAM of having a system like this without fastening the bottom ends in any city that experiences decently-sized earthquakes. The right kind of back-and-forth shaking could start that whole unit swinging away from the wall and back again, and now you’ve got force at the top pulling straight out from the wall with some twisting, torqueing, and shearing thrown in for good measure. That’s NOT what you want for bolts in drywall, and even with bolts in wall studs, it’s not a great situation, especially when the rails are just hooked on. Bottom line: I think any such system should use rails fastened on the bottom if your closet is the kind that shakes. I highly recommend spending the extra few bucks on one fastener for the bottom of each rail, and if attaching it into dry wall, I recommend using an anchor that spreads on the other side of the wall like a toggle or molly bolt. That last screw could be the straw that saved the camel’s back.